Highlights of Council's Agenda includes Resolutions that would authorize accumulated leave payment to former Township Manager Stephen Bonanni and former CFO Jill Gougher as well as a resolution to adopt a New Invocation Policy. Township Manager Arch Liston confirmed in an email that both resolutions listed on the agenda in reference to the Accumulated Vac & Sick Time for Managerial Employees, not only pertain to Bonanni and Gougher, but also contain the same amount previously released by the Township and later reported by GallowayTwpNews. The balance to be paid on both employees equals $94,855.67. A resolution to Adopt a New Invocation Policy is also listed on the agenda. Over the past several months, Council has opted to lead the Council Meetings in a Moment of Silence instead of by Invocation which was adopted originally in 2010. After speaking with Mayor Don Purdy, it is anticipated this new policy of pre-approved selected prayers will most likely be adopted. We submitted an email to Township Solicitor Michael Fitzgerald voicing our concern over the new proposed policy and how the policy could potentially in our opinion be in violation of an Eleventh Circuit District Court Decision of Crowe vs. Cobb County, Georgia. Fitzgerald responded by stating, "First, this decision, which is from another Circuit and not the Circuit in which New jersey is located, as I read it does not prohibit a body from having approved prayers. Second, it might be legal to have a mix of clergy give sectarian prayers, but the courts disagree on this and having such a policy potentially opens the Township to litigation. Also, having an appropriate mix of clergy can be difficult to implement and municipalities have been challenged on their selection process. Third, nothing in this area is entirely settled or entirely clear, but I believe that Council’s approach addresses the prayer issue in a sensitive manner and minimizes the legal exposure." In our response to Fitzgerald we stated, "It is my understanding case law from other Circuits can be used in New Jersey and considered as Persuasive Law, not binding on the jurisdiction. The degree of reliance would be pending on the absence of law in that jurisdiction." It is my opinion, Council approving a pre-selection of prayers may in fact violate the Establishment Clause. By Council approving a policy that contains a selection of prayers, Council would not only be restricting religion, but also endorsing certain faiths and religions. The new proposed policy may easily be challenged as all faiths may not be represented in the selection. It is also my opinion, by Council approving the pre-selection of prayers, may also in fact violate Marsh v. Chambers in the Crowe v. Cobb County decision as the the court affirmed, they "refuse to embark on a sensitive evaluation or to parse the content of a particular prayer. Whether invocations of "Lords of Lords" or the "God of Abraham, Issac and Mohammad" are sectarian is best left to the theologians, not courts of law." If the court ruled they would not interfere, than why would Galloway Township restrict a policy that specifically does what the courts would not. 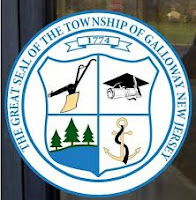 I agree this is a sensitive issue for everyone and maybe some specifically, but why is Galloway Township changing a policy that could have been held up in court, more so than the new proposed policy. The Township could face litigation for the mere purpose of challenging the selection of prayers with Council approval which is more restrictive than an open invitation to all faiths and religions to provide an invocation on a rotating basis as already approved." Galloway Township Council Meeting is Tuesday January 22, 2013 at 6:30 p.m. located in Council Chambers. We will report on Council's decisions and post the new Invocation Policy if the Resolution is adopted by Council. Even if the prayer was legal, it's still a bad idea, as it excludes anyone who doesn't believe in a monotheistic God. Why mess with a moment of silence, which allows all faiths and none to be included? This prayer issue is simply another Bassford legacy to Galloway. He was warned at the outset that an opening prayer at the Council meeting was a bad idea but he decided to stay with his uninformed decision. Bassford, single-handedly, destroyed Galloway on many levels. The Council was complicit in that they permitted his bullying ways. The payout of Bonnani's sick time should be offset by the litigation costs that he created. This prayer issue is just an utter waste of time. It's such a non issue. It's offensive that they are wasting time bickering about praying before a meeting when they should be working on fixing the issues within the township. The Bonanni payout is a slap in the face to every single taxpayer in Galloway. This guy should be relentlessly investigated and ultimately prosecuted for his actions. This guy is a stain in the history of the township and his "career" was a joke on all of us. It's amazing how we will acknowledge Muslim, Hindu and Buddhist countries based on their religious majorities, but ignore, not only the religious Christian majority, but the basic Christian principals this country was built on. By the definition of world opinion, we are a Christian Nation and deserve the same rights that other major religions have in their countries. What’s the big difference? Because of this Christian Nation we welcome others to believe and worship in their own way, along with us, without fear of imprisonment or death. Besides, three of the major religions Christians, Jews and Muslims pray to the same God. I cannot believe that residents of this twp read about the settlement bought about by Bonanni's sick behavior and will be presented with this payout scheme. Yeah, I know the attorneys will go on and on about how we are legally obligated and blah blah blah. It seems like that is always the cover story for this type of injustice. Council members who think themselves as "bold" or "on the cutting edge" of issues like the idiotic prayer nonsense should step up and be "bold" and "on the cutting edge" of issues such as this and defy the so called "law" that they help create. we need to talk about changing the laws that hurt us constantly. The Ole Hansen development mentioned earlier would be another great place to start. How's that for "bold" and "fresh". Getting real tired of this lame nonsense.